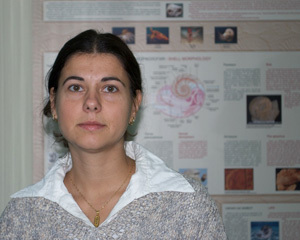 Born: 18 September 1977, Sofia. Education: University of Mining and Geology (2003). Speciality: geology and prospecting of mineral deposits, engineer-geologist, MSc. Curation: collection of Early Cretaceous corals. History and cataloguing of the palaeontological collections. Vašíček, Z., Motchurova-Dekova, N., Ilcheva, A., Metodiev, L., 2012. Taxonomy of Late Jurassic - Early Cretaceous ribbed aptychi from Bulgaria. — Neues Jahrbuch für Geologie und Paläontologie — Abhandlungen, 265 (3): 249—274. Ilcheva, A., Motchurova-Dekova, N., 2011. Catalogue of the type collections of Early Cretaceous corals (Scleractinia, Anthozoa) at the National Museum of Natural History, Sofia. — Rev. Bulg. Geol. Soc., 72 (1—3): 129—140.